Haiti’s Lawyer: U.S. Is Arming Anti-Aristide Paramilitaries | Democracy Now! Contributing editor of the Columbia Journalism Review. His article “Now They Tell Us”: appears in the new issue of the New York Review of Books. Chamblain was convicted and sentenced in absentia to hard-labor for life in trials for the April 23, 1994 massacre in the pro-democracy region of Raboteau and the September 11, 1993 assassination of democracy-activist Antoine Izméry. Chamblain recently arrived in Gonaives with about 25 other commandos based in the Dominican Republic, where Chamblain has been living since 1994. They were well equipped with rifles, camouflage uniforms, and all-terrain vehicles. Among the victims of FRAPH under Chamblain’s leadership was Haitian Justice Minister Guy Malary. He was ambushed and machine-gunned to death with his bodyguard and a driver on Oct. 14, 1993. According to an October 28, 1993 CIA Intelligence Memorandum obtained by the Center for Constitutional Rights ”FRAPH members Jodel Chamblain, Emmanuel Constant, and Gabriel Douzable met with an unidentified military officer on the morning of 14 October to discuss plans to kill Malary.” Emmanuel “Toto” Constant, was the founder of FRAPH. An October 1994 article by journalist Allan Nairn in The Nation magazine quoted Constant as saying that he was contacted by a US Military officer named Col. Patrick Collins, who served as defense attaché at the United States Embassy in Port-au-Prince. Constant says Collins pressed him to set up a group to “balance the Aristide movement” and do “intelligence” work against it. Constant admitted that, at the time, he was working with CIA operatives in Haiti. Constant is now residing freely in the US. He is reportedly living in Queens, NY. At the time, James Woolsey was head of the CIA. Another figure to recently reemerge is Guy Philippe, a former Haitian police chief who fled Haiti in October 2000 after authorities discovered him plotting a coup with a group of other police chiefs. All of the men were trained in Ecuador by US Special Forces during the 1991-1994 coup. Since that time, the Haitian government has accused Philippe of master-minding deadly attacks on the Police Academy and the National Palace in July and December 2001, as well as hit-and-run raids against police stations on Haiti’s Central Plateau over the following two years. Kurzban also points to the presence of another FRAPH veteran, Jean Tatoune. Along with Chamblain, Tatoune was convicted of gross violations of human rights and murder in the Raboteau massacre. Kurzban says he has hired military analysts to review photos of the weapons being used by the paramilitary groups. He says that contrary to reports in the media that the armed groups are using weapons originally distributed by Aristide, the gangs are using highly sophisticated and powerful weapons; weapons that far out-gun Aristide’s 3,000 member National Police force. 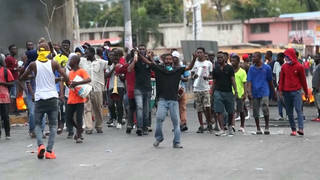 Chamblain and other paramilitary leaders have said they will march on the capital, Port-au-Prince within two weeks. The US has put forth a proposal, being referred to as a peace plan, that many viewed as favorable to Aristide’s opponents. Aristide accepted the plan, but the opposition rejected it. Washington’s point man on the crisis is Roger Noriega, Undersecretary of State for Western Hemispheric Affairs. AMY GOODMAN: We’re going to start with Ira Kurzban, a Miami based lawyer. Since 1991, he served as General Counsel for the government of Haiti. Welcome to Democracy Now!. AMY GOODMAN: It’s good to have you with us. What is your assessment of what’s happening in Haiti right now? IRA KURZBAN: Well, I think this is clearly a military operation, and it’s a military coup. We have analyzed the kinds of weapons that these people have brought from the Dominican Republic, who they are, how they’re organized, and they’re organized, really, as a military commando strike force that’s going from city to city. They’re very well organized, and they’re armed to the teeth with the kinds of weapons, Amy, that really, no one has ever seen in Haiti, except when Haiti had an army. This notion that somehow, you know, this is kind of a rag-tag group of people who had arms that they got originally from Aristide, which is kind of what’s playing in the press generally, is just totally untrue. When we have looked at the weapons that they have, they have M-16’s, M-60’s. They now have armor piercing weapons they have rocket propelled launchers. They have weapons to shoot down the one helicopter that the government has. They have acted as a pretty tight-knit commando unit, and they’re led by, as I think you were pointing out in the introduction — they’re led by people who were former associates of the Defense Intelligence Agency, Jodel Chamblin was the trigger man for FRAPH during the military coup, when FRAPH — when FRAPH was written was a creation of the Defense Intelligence Agency of the United States. There’s enough indications from our point of view, at least from my point of view, that the United States certainly knew what was coming about two weeks before this military operation started. The United States made contingency plans for Guantanamo. The U.S. Ambassador in Port-au-Prince began the process of warning American citizens and asking them to register. This was a week before any of this, and two weeks before any of this happened. So, there was a clear feeling that something was going to happen, and what really happened is the combination of Jean Tatun who is a person that the press has rarely reported about in Gonaives, who was a former FRAPH person who we tried and convicted for gross violations of human rights and murder in Raboteau, and is behind what’s going on in Gonaives. He had strong connections with Chamblain, the ex-head of FRAPH, and Guy Philippe, a former member of the Haitian armed forces who has attempted previous coups, not only against Aristide, but the Preval government. These people came through the Dominican border after the United States had provided 20,000 M-16’s to the Dominican army. They came through the border, that is Philippe and Chamblain with a really small army of about 20 or 30 highly trained military people with these M-16’s and M-60’s and all of this other equipment that came through the Dominican border with — in several trucks with very, very heavy equipment. And quite frankly, I believe that the United States clearly knew about it before, and that given the fact of the history of these people, we are probably very, very deeply involved, and I think congress needs to seriously look at what the involvement of the Defense Intelligence Agency and the Central Intelligence Agency has been in this operation. Because it is a military operation. It’s not a rag-tag group of liberators, as has often been put in the press in the last week or two. The second part of it is that it’s clear that as a result of a number of stories that have come out in the last two days that the so-called peaceful opposition has been working very, very closely with these people. Guy Philippe was quoted in the Associated Press yesterday saying with a big smile on his face that he has not been officially in contact with the opposition, but that he has received money and support from the Haitian business community. Well, the Haitian business community are the people who are behind what’s called the group of 184. Those are the people who were so-called peaceful opposition. It’s clear to us that they’re stalling tactics in the last week have been designed to develop a fate accompli on the ground. I think that’s what we’re seeing right now. AMY GOODMAN: Ira Kurzban, you’re saying that you believe that the U.S. Is arming the opposition and did it through sending weapons to Dominican Republic, which were then given over to the opposition and came across the border? IRA KURZBAN: That’s right. I don’t think that there’s any question about the fact that the weapons that they have did not come from Haiti. They clearly came over the Dominican border when Philippe and Chamblain entered Haiti about two weeks ago. AMY GOODMAN: Hadn’t Guy Philippe been arrested in the Dominican Republic at one time? IRA KURZBAN: Yes. Guy Philippe was heavily involved in drug dealing in Cap-Haitien and was involved in a coup against Preval. And the reason I point that out is because a lot of the press reports are saying this is all about Aristide and so forth. It has nothing really to do with Aristide. This is a military operation designed to bring back the Haitian army. And I think that the Defenses Intelligence Agency has always wanted to push to have the army reconstituted. So Philippe was involved in a coup in the year 2000 against President Preval and the thrust of that then just as the thrust of it now is, we want to bring back the Haitian Army. So under the cover of this is all about Aristide and how undemocratic he has been and so forth, it’s really an operation to bring back the army. When he tried the coup in 2000 he was fired from the police and fled to the Dominican Republic and the Haitian government has made many efforts to extradite him and to put him on trial. As a result of not only that effort but what happened on December 17 where one of his cohorts readily admitted that Philippe and his cohorts were involved in a coup to take the National Palace. They have tried this two or three times in different ways. There was an effort in July of 2001 to capture the police stations in Haiti, and that was unsuccessful. There was another effort on December 17 to take the National Palace, and that was unsuccessful. And obviously, they have regrouped. They have obtained these kinds of very, very heavy weapons. And are coming across the border. Yes, I — to be perfectly clear, Amy, I believe that this is a group that is armed by, trained by, and employed by the intelligence services of the United States. I think that the congress really needs to take a very careful look at this now. AMY GOODMAN: We’re talking to Ira Kurzban, who since 1991 has been a lawyer for the Haitian government, a Miami-based attorney. We have to break and we’ll come back in a minute. AMY GOODMAN: This is Democracy Now!, the war and peace report. I’m Amy Goodman as we talk about the very dire situation in Haiti right now. On the line with us is Ira Kurzban, an attorney for the Haitian government. Do you expect to see Port-au-Prince fall to the opposition forces, heavily armed in the next few days? Is Aristide expecting this? Is Aristide expecting to be forced out again? IRA KURZBAN: The president went on national TV in Haiti and also spoke with the international community yesterday saying what’s really going on about this military coup and asking for international assistance. I mean, the Haitians who are in Port-au-Prince and the police who have acted very, very valiantly against very difficult odds and the palace security are all prepared to fight, and I think they will fight. I don’t think that you are going to see the situation that you have seen in some other places where they — this military operation has been able to roll into the cities because of their disproportionate fire power. And one thing I think that needs to be made clear, Amy, in this is when the press reports that these people easily went into the city because there’s so much opposition to Aristide, I think it’s really doing a disservice to the American public because what’s happening is people are trying to fight back with machetes and rocks and bottles, and they’re facing M-60’s which are the weapon that Rambo had in the movie. I mean, these are huge, powerful weapons against people who are trying to stand up for democracy and of course, you know, they are — they have not been able to stop this well-armed and well-trained group of commandos. And I think the situation, though, in Port-au-Prince is very different. There are many, many police now in Port-au-Prince. There are security forces in Port-au-Prince. I think they’re prepared to fight. I think they will fight. I think the president, and really being a statesman, is trying to say to the world, we need to stop this. You know, this is the 21st century. Haiti should be moving forward. We should be moving forward toward peace. We should resolve this in a peaceful way. There’s going to be a lot of bloodshed and with bloodshed, there’s also going to be boat people who are going to be fleeing the country in the next six months or a year. If these guys do take over, they’re bad actors. These are people who were killers and even as the Secretary of State acknowledged, thugs and criminals who have a very, very bad human rights history in Haiti. AMY GOODMAN: Roger Noriega led the delegation to Haiti to broker the peace plan, the former aide to Jesse Helms. What do you think his role in this is, Ira Kurzban? IRA KURZBAN: I think Noriega has been an Aristide hater for over a decade. I would like to think that he was really trying to broker a sincere agreement, but when I saw what happened, and I was there on Saturday before the President almost immediately agreed, after an hour or two discussion, to the peace plan where it would clearly result in his having to share power with people who have been his bitter enemies for a long time and then the opposition said we needed several more days, and you know, Noriega and the others were willing to give it to them, my reaction was they’re just giving them more time so they can take over more, that the military wing of the opposition can take over more ground in Haiti and create a fate accompli and indeed, as soon as they said, we need an extra day, I predicted, unfortunately, and correctly, that they would go into Cap Haitian and indeed the next morning they did. The thing that’s peculiar and I don’t think Americans understand this, the leader of the opposition, Andy Apaid, is an American citizen. He is not a Haitian citizen, because Haiti does not recognize dual nationality. One must choose either their Haitian citizenship or their U.S. citizenship. He has never renounced his U.S. Citizenship. We have the leader of the opposition, who Mr. Noriega is negotiating with, who Secretary Powell calls and who tells Secretary Powell, “you know, we need a couple more days” and Secretary Powell says that’s fine. I mean, there’s some kind of theater of the absurd going on with this opposition where it’s led by an American citizen, where they’re just clearly stalling for time until they can get more ground covered in Haiti through their military wing, and the United States and Noriega with a wink and nod as kind of letting them do that. Now they have said no. Presumably if the U.S. is serious, about what Secretary Powell said in preserving democracy and allowing President Aristide to fulfill his term, he agreed to the peace plan. They have not. The next step clearly is to send in some kind of U.N. Peacekeeping force immediately. AMY GOODMAN: It’s interesting that you said that Secretary of State Colin Powell called them, what did you say, criminals and thugs. AMY GOODMAN: Because when President Clinton announced that the U.S. was going to be moving in, to challenge the coup of 1991-94, he talked about them as murderers and rapists and criminals. Meanwhile, Emmanuel Constant, the head of the FRAPH at the time was on the payroll of the Defense Intelligence Agency. This is when James Woolsey was the head of the C.I.A. On the one hand, you have the president attacking them and on the other hand, you have the people leading the coup on the U.S. payroll. IRA KURZBAN: I think that there is — as I said before, I believe that Congress should certainly look at, and investigate what the role of the Defense Intelligence Agency and the C.I.A. is here. You know, I personally believe that they are involved, given the history, given the nature of the weapons that these people have, and given that their major demand is the return of the Haitian army, even more than anything — any other demand they have made in the last two weeks, and given these long-standing ties. So, yeah, I — it’s true that the Secretary has said what he said, and we hope that he is sincere in saying that. And we hope that he is going to act on it now, and that the administration is going to act on it. The President of Haiti facing a military coup, has now said, we need international assistance. He said it to the world yesterday. And the question is, will the world act or will they allow a democracy to be destroyed. No one has ever contested that President Aristide’s election was not a full, fair election and no one has ever said that Aristide would not have been elected in the year 2000 because of his overwhelming popularity. The question is will the international community stand by and allow a democracy in this hemisphere to be terminated by a brutal military coup of persons who have a very, very sordid history and gross violations of human rights. AMY GOODMAN: Ira Kurzban, lawyer for the Haitian Government.